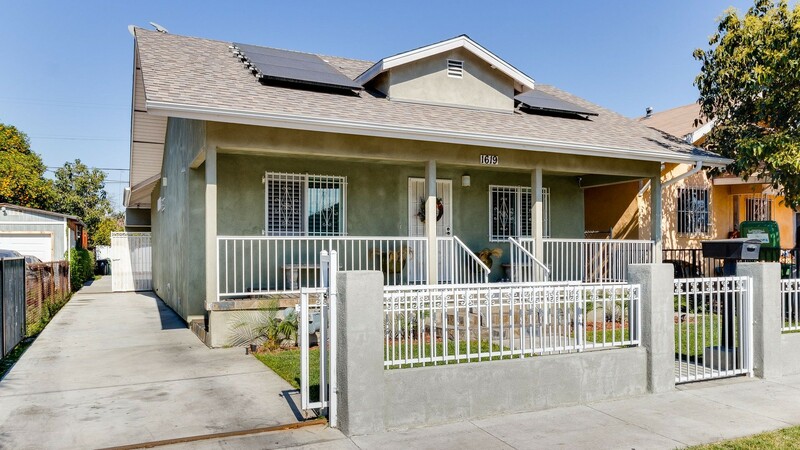 Welcome to this gorgeous pride of ownership California-style bungalow that combines both its vintage character with beautiful modern upgrades! As you are driving up, there is no doubt of the stunning curb appeal displayed by the beautiful fenced in front covered porch with just enough lawn to minimize maintenance & water usage. This 3 bedroom 1 bath home provides an open functional floor plan with an adjoining kitchen, dining & living area. Imagine the family unity here, it's not only convenient to have the living & dining room located off of a kitchen, the connected space allows for a fun & open integration of the three spaces. This home was fully rehabilitated in 2013: New roof with paid off solar panels, new electrical, new plumbing, new double pane windows & custom sized window shutters, hardwood flooring through out, new central air/heating system, new cherry kitchen cabinets with granite counter tops, high ceilings with crown molding, And the bonus here is as an attached custom built stucco patio with recess lighting and mounted flat screen TV....Yes, you can create your personal outdoor living space in this area! Possibilities are endless. Commuters enjoy close proximity to LA Coliseum, the future LAFC Stadium, USC Village, museums, freeways & short commute to DTLA, Arts District, Walking distance to Metro Link Station. Do not miss this one-of-a-kind home with tons of character & charm!